Ever wondered which is the best all terrain binocular for hunting trips, bird watching, trekking etc? Well, wonder no more, for according to Nikon, the Nikon 7 line of binoculars is the best there is. It is this bold statement that inspired me to buy the Nikon monarch 7 10x42 binocular. To help you decide whether this is the binocular for you below is my detailed Nikon monarch 7 10x42 review. Also I tried to elucidate a brief Comparison of Why should buy Nikon monarch 7 binoculars 10x42 over Nikon monarch 5 10x42. The monarch 7 10x42 is an all-terrain binocular thanks to its rubber construction. The rubber coated casing of this binocular is comfortable to hold. I found the rubber eye cups on this binocular to be comfortable on my face. Apart from being comfortable, this monarch 7 model is also shock absorbent. The o-ring housing of this Nikon 10x42 monarch 7 atb binocular is filled with nitrogen making it resistant to being fogged. Nikon binoculars monarch 7 10x42 is an attractive binocular. Compared to earlier Monarch models such as the monarch 5, this monarch model is shorter and wider. The physical dimensions of this binocular are 5.7 inches by 5.1 inches by 1.6 inches. In regards to price, the monarch 7 is considerably pricier than other monarch binoculars. Using the nikon 10x42 monarch 7 atb binocular proved to be a delightful experience thanks to its smooth and fast focusing. I am able to focus on close objects as well as far away objects without losing fine focus. With a focus wheel as wide as your finger, this binocular is easy to focus and can focus on objects as close as 8 feet. The most important part of any binocular is the optical system. To give it an edge over its competitors, this monarch 7 has Extra-low Dispersion or ED glasses. These glasses offer unrivaled brightness and high resolution. This is an addition to providing you with improved close focus capabilities. As if that is not enough, Nikon throws in advanced coatings on all the binocular’s lens and prisms. These coatings increase light transmission and produce an image quality almost similar to that of the human eye. Designed for use in all kinds of terrain, the monarch 7 nikon binocular is a great performer. To ensure that you do not experience color fringing, this binocular is equipped with roof prism with corrective coatings. These prisms distribute colors evenly and ensure that the end image is not only clear but is also well saturated. Now let us compare the nikon monarch 7 vs monarch 5. But before have a look a short comparison chart. From the above comparison table of nikon monarch 7 vs monarch 5 it is clear that there are almost every features are same but monarch 7 has wider field of view. Though the monarch 7 is pricier than the monarch 5, it is well worth the price. For starters, the monarch 7 uses a coating that is far much better than that used in the monarch 5. This means you get a better image quality with the monarch 7. Additionally, the new monarch 7 is compact and weighs less than the monarch 5. The multi-coated ED glass of the monarch 7 minimizes glare making it a better binocular compared to the monarch 5. Also, having used the monarch 5 before I feel that it does not match up to the monarch 7’s brightness in low lighting. But Still I am telling that monarch 5 is bad. It is best on its own way. If you have tight budget and can not afford monarch 7 then obviosuly monarch 5 will be the Best for you. One of the most frequently asked questions about the monarch 7 10x42 is whether it comes with a case and a harness? Another frequently asked question is whether there is any difference between the monarch 7 binocular and the monarch 7 ATB. The term ATB refers to all terrain binocular, thus since the all monarch 7 models are all terrain there is no difference between monarch 7 ATB and monarch 7 binocular. Yet another frequently asked question is where this binocular is manufactured. From this Nikon monarch 7 reviews there is no denying that the monarch 7 is the one of the best binocular in Nikon’s portfolio. 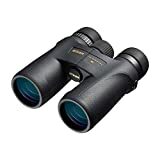 That being said, the improved field of view you get with this binocular couple with its Nikon’s proprietary coating technology make it a worthy contender for the best all terrain binocular award. Additionally, despite its price tag, this binocular offers value for your money. This is because it is probably the cheapest binocular in its price range.